1 Begin by getting a pan nice and hot over high heat. Pour some oil and just cook the lamb until evenly brown. Do not overcrowd the pan to avoid juices from coming out of the meat. Cook by batches if necessary. This will cook about 3 -5 minutes. 2 Remove and transfer the lamb and remove any excess oil. Now, with the same pan, throw in the garlic, onions and tomatoes. 3 Add tomato paste and return the lamb to the pan. 4 Pour water and bay leaf. When the water boils, add Knorr Beef Cube and cook this for an hour. 5 Add the carrots and fried potatoes. 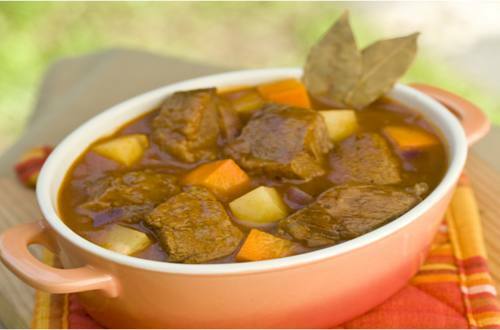 When the lamb, carrots and potatoes are tender, add the flour dissolved in water to thicken the sauce. And that’s our dish! 6 Serve this to your family and see their reaction when they try the dish. It’s delicious! 7 Cook this for 1 hour then add the carrots and fried potatoes. 8 When lamb, carrots and potatoes are tender, add the flour dissolved in water.